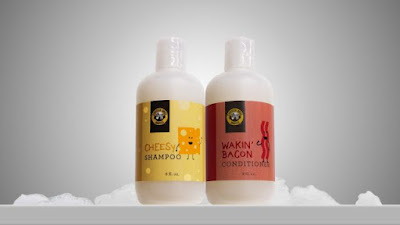 As one of the stranger ways to push their Cheesy Wakin' Bacon sandwich, Einstein Bros. is selling new cheese-scented shampoo and bacon-scented conditioner online for a limited time. They're currently out of stock but a gift set including an 8-fl oz bottle of Cheesy Shampoo and an 8-fl oz bottle of Wakin' Bacon Conditioner is priced $9.99 at www.einsteinbros.com/smelledible. The promo is "while supplies last" but there is a prompt on the site that invites you to leave an email for when (if?) the set is again available. The Cheesy Wakin' Bacon sandwich was introduced earlier this year in January and will be available at Einstein Bros. through May 2, 2018.